Seven Glorious Days — Karl Giberson, Phd. What would the biblical creation story look like if it was written today? Is it possible to view modern scientific explanations as "creation stories"? Using biblical imagery and vivid metaphors, popular author and leading science-and-religion scholar Karl Giberson recasts the Genesis creation story within the framework of the latest ideas from modern science. Seven Glorious Days takes the reader on a grand ride through the history of the universe from the Big Bang, to the origin of stars and planets, to the appearance of living creatures bearing the image of God. The narrative is accessible, lively and faith-affirming. Readers worried about the tension between science and religion will welcome their harmonious convergence in this timely and provocative book. 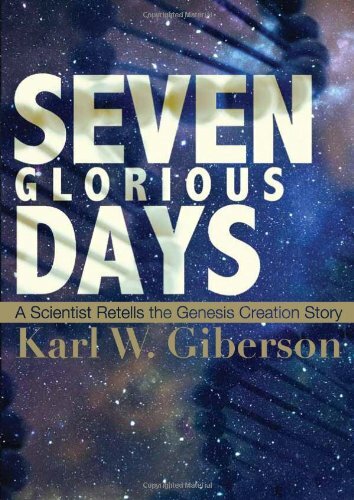 Karl Giberson’s Seven Glorious Days presents an attractive and readable account of creation showing that there is no need to oppose scientific and biblical ways of understanding the origin of the world. His ability to translate the complex insights of physics, cosmology, and biology into terms that ordinary Christians can grasp is matched only by his ability to express deep religious convictions in simple and direct language. The first thing I loved about the book was that, instead of trying to make the Bible into a science text book, Karl respected the Bible for what it is and figured out a way to make it relevant to our time and our current understanding of science. This, of course, is in sharp contrast to the well-meaning Bible-thumpers who try desperately to make science confirm and reveal the essence of the biblical texts. I have my students comment upon a rationalization written by one such individual who tries assiduously to make the statement in Leviticus about grasshoppers talking on four legs not violate the reality that grasshoppers have six legs. The Bible can’t be wrong, of course, so two of the legs don’t count. i.e., the hind legs are different, so they’re not really legs and the Bible continues to be literally true. Or so the argument goes. I knew I was in for a different experience when, on page 3, Karl wrote ‘I have come to appreciate just how tragic it is that so many young people believe they have to accept the ancient worldview in Genesis as an accurate description of the world of today—as if the science of the Bible was millenia ahead of its own authors.’ That pretty much says it all. But the good news, as Karl goes on to explain, is that the Bible speaks to us in our time too and with great eloquence when released from the constraints of literalism. Using the Logos of creation as a unifying theme is brilliant. I also appreciate the courage Karl has shown in being willing to allow the biblical text to grow. People can be so married to the wording in whatever Bible they are reading that they reject any amendment — not realizing, of course, that the Bible was written in essence by committee, that the canonic texts were voted on, that a lot was left out. Karl alerted us on page 5 to the reality that ‘I have thus located God’s creativity within the natural order, collaborating with those laws, rather than working apart from them.’ This is profound. The discussion, in Chapter Three, of the various astronomers and their contributions to the foundations of science were illuminating and thought-provoking. I have long been a fan of Owen Gingerich but learned more about the processes that led to the major discoveries by reading your book. It is possible that I may now understand SOMETHING about supernovas. But don’t make me take a quiz. I appreciated the material on Day Five since it is closer to my realm of understanding. Nonetheless, I both learned a lot and loved Karl’s take on many issues. I was particularly taken by his emphasis on cooperation as a driving force in evolution rather than a recitation of Tennyson’s ‘nature red in tooth and claw’ meme. Karl talks about the Bonobo, Kuni—a specific example about which I did not know. However, there is a 2013 paper in PLOS ONE about sharing among Bonobos and a paper in Animal Behavior in 2012 that discusses the apparent emotional response of scrub jays to dead conspecifics which are described as ‘funerals.’ The idea that cooperation and — dare I say it — love might be as important even among the so-called lesser species is now making it into scientific journals. ’Curiously, we feel an unusual license to place our hands on the stomach of a pregnant woman.....’ SO TRUE. ’Parents typically have no trouble nurturing adopted children.....’ Also true. We had 4 biological kids and then adopted 3 special needs kids. We love them all, couldn’t imagine life without any of them. ’Nature, we might say, solved the problem of the big brain by creating big love.’ What a great way to put it. Day Seven — OK, this is really good stuff. God didn’t rest on the 7th day.... Why would He? He is, after all the creator of everything. No Sundays off for Him. He gave us the capacity to love so that we might achieve a better understanding of each other and of Him. The expansion of the act of creation to include love is, on the one hand a simple and logical extension, but on the other hand, the ingredient that has been missing from other discussions of creation. It explains biology and provides a reason to believe. Here’s another big idea: Karl spends most of the book talking about science and one might conclude that he’s a purist who eschews the idea of a God who intervenes in human affairs. But then he announces on page 170: “God can work within the natural order as a free and independent agent, just as we do.” In my mind (and heart), the ideas that God codified love as his crowning achievement and is capable of intercession in this world make the book the kind of volume that should be read many times. For this I am thankful.